I am the one who rests in what is, tangled, messy, brittle, fragile. I am the one who trusts that change is unfolding even as I rest, that these thin weedy branches are enough to support me, they are stronger than they appear and so am I. I am the one aware of light gathering around the edges of life, tender, tenuous, ending and beginning again and again. Beautiful image, Laura, and perfectly titled. Stunning in its simplicity, Laura. It is so healing to rest in what is, yes? I hope you and your family have a lovely weekend of family time and care. Resting and accepting. Beautiful image. Beautiful autumnal image. I enjoy the peace of autumn. Exquisite! Resting in what is..is a practice all unto itself. Simply beautiful! Beautiful, both words and image! 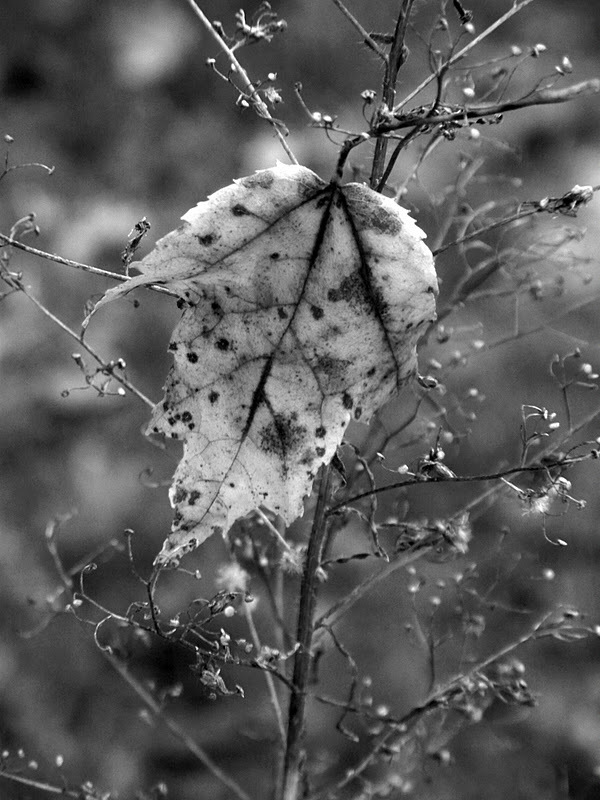 I love these reasons Autumn in B & W, beautiful and creative composition, wonderful result. The leaf is wondering where all it's friends went! Neat composition, I like the patterns in the background. Your image is beautiful, and a wonderful illustration of rest. Excellent photo Laura. I like the B&W more than the color. Laura, Oh, how much I miss your creativity in healing one's heart, spirit and mind. This is no different. It brings me to the year long journey with Jan where we are learning "I am enough." This speaks volumes to me. At any moment, with any circumstance, if we stop and awaken to what our wise heart and wise mind is telling us...we will know "all is enough." Thank you for this blessing. xo my dear friend!